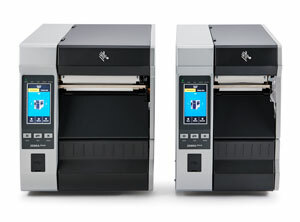 The Zebra ZT610 and ZT620 Industrial Printers keep your critical operations running smoothly, offering high-performance industrial printing systems that can stand the test of time, both physically and technologically. Zebra’s ZT600 series advances the legacy of their industry leading Xi Series predecessors, offering next-generation operational visibility, control and adaptability to meet your evolving needs—all with the rugged durability and 24/7 reliability you expect from Zebra. 4.09" Industrial Printer, Tear Bar, 203 dpi, 14 ips, Ethernet, USB, Serial, Bluetooth, Thermal Transfer. 4.09" Industrial Printer, Rewind, 203 dpi, 14 ips, Ethernet, USB, Serial, Bluetooth, Thermal Transfer. 4.09" Industrial Printer, Tear Bar, 203 dpi, 14 ips, Ethernet, USB, Serial, Bluetooth, 802.11 AC, Thermal Transfer. 4.09" Industrial Printer, Cutter, 203 dpi, 14 ips, Ethernet, USB, Serial, Bluetooth, Thermal Transfer. 4.09" Industrial Printer, Tear Bar, 600 dpi, 6 ips, Ethernet, USB, Serial, Bluetooth, Thermal Transfer. 4.09" Industrial Printer, Rewind, 600 dpi, 6 ips, Ethernet, USB, Serial, Bluetooth, Thermal Transfer. 4.09" UHF RFID Printer, Tear Bar, 203 dpi, 14 ips, Ethernet, USB, Serial, Bluetooth, Thermal Transfer. 4.09" UHF RFID Printer, Tear Bar, 300 dpi, 12 ips, Ethernet, USB, Serial, Bluetooth, Thermal Transfer. 4.09" UHF RFID Printer, Tear Bar, 600 dpi, 6 ips, Ethernet, USB, Serial, Bluetooth, Thermal Transfer. 6.6" Industrial Printer, Tear Bar, 203 dpi, 12 ips, Ethernet, USB, Serial, Bluetooth, Thermal Transfer. 6.6" Industrial Printer, Rewind, 203 dpi, 12 ips, Ethernet, USB, Serial, Bluetooth, Thermal Transfer. 6.6" Industrial Printer, Tear Bar, 203 dpi, 12 ips, Ethernet, USB, Serial, Bluetooth, 802.11 AC, Thermal Transfer. 6.6" Industrial Printer, Cutter, 203 dpi, 12 ips, Ethernet, USB, Serial, Bluetooth, Thermal Transfer. 6.6" Industrial Printer, Tear Bar, 300 dpi, 8 ips, Ethernet, USB, Serial, Bluetooth, Thermal Transfer. 6.6" Industrial Printer, Rewind, 300 dpi, 8 ips, Ethernet, USB, Serial, Bluetooth, Thermal Transfer. 6.6" Industrial Printer, Tear Bar, 300 dpi, 8 ips, Ethernet, USB, Serial, Bluetooth, 802.11 AC, Thermal Transfer. 6.6" Industrial Printer, Cutter, 300 dpi, 8 ips, Ethernet, USB, Serial, Bluetooth, Thermal Transfer. 6.6" UHF RFID Printer, Tear Bar, 203 dpi, 12 ips, Ethernet, USB, Serial, Bluetooth, Thermal Transfer. 6.6" UHF RFID Printer, Tear Bar, 300 dpi, 8 ips, Ethernet, USB, Serial, Bluetooth, Thermal Transfer.